The DKN heavy duty linear smith machine is a robust piece of equipment that blends performance with safety and ensures extra smooth action both during slow, controlled movement and faster dynamic work. Featuring a sturdy construction with hard-chromed solid guide rods and a heavy duty frame comprised of heavy gauge steel with powdercoat finish, the machine provides great stability and offers a 220cm (86.6”) solid Olympic lifting bar. It is suitable for developing strength, building muscle mass and toning upper and lower body and there are multiple bar catchers and safety spotters perfect for squatting. 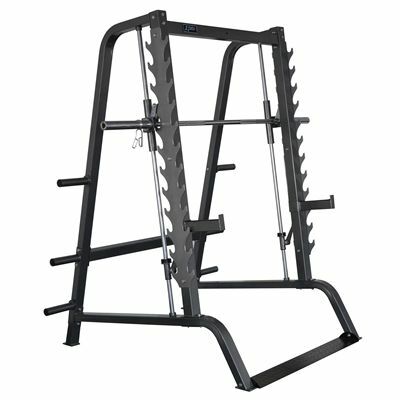 To guarantee natural body movement, the guide rods are placed at 7 degree pitch and for the free weight barbell exercises, the smith machine has a multi-position rack. You can combine this machine with the optional DKN heavy duty weight bench, as well as a pec deck and pulley system to create a great, multi-functional piece of equipment that will meet your workout needs. for submitting product information about DKN Heavy Duty Linear Smith Machine We aim to answer all questions within 2-3 days. for submitting product information about DKN Heavy Duty Linear Smith Machine. We aim to answer all questions within 2-3 days. If you provided your name and email address, we will email you as soon as the answer is published. What weight plates fit on this 2”? Yes, the machine is compatible with Olympic 2" (5cm) weight plates. Does this include any weights? Hi, how much does this smith machine weight? Buying a Smith machine for less than £1000 I was told would not be sensible. But as I use one in the gym, wanted one at home and didn't have the budget for something like that I took a punt and purchased the DKN. If anyone tells you that you can't get a decent smith machine for less than a grand then I'd suggest you point them to this. It's easily as smooth and sturdy as the one in my gym. It hasn't caught even once. I use it mainly for reverse close grip bench,btn shoulder press, and standing calf raises and I'm very happy with it. Would recommend this any day. Worth every penny. Thanks. for submitting product review about DKN Heavy Duty Linear Smith Machine.